This feels awkward. I'm still here, and I've desired to write lately, but there's a little something that keeps getting in the way, so I'd like to deal with it. Namely, not being around for a couple of months. I'm going to go beyond a simple apology because although what's been occupying my time and life really has been personal (and broader than what I'm going to write about now) and there are a lot of details that I'm going to omit here because yes, they're personal, there's something really important that I've learned that I'm going to write about because it's a lesson that I cannot let myself forget. Ha! He'll like that....Actually, it's more along the lines of him, frustration in his eyes, sitting across from me at the kitchen table, saying "you can't take care of everybody." Now, most of you who know me could probable take a stab at what would be my usual response to that. "No, but I can try...."
That's my daily medicine. 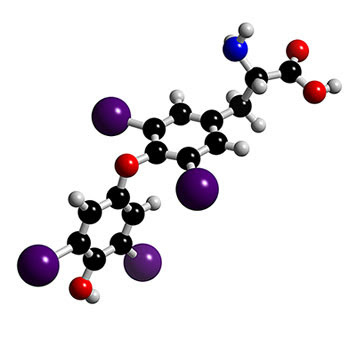 That is one molecule, one vital link, in all the hormonal workings in my body. And to this I say to myself, to remember: You cannot argue with physics. If you don't pay attention, sooner or later the physical world is going to smack you, and you'll be caught by surprise. Which brings me to gratitude. I have a great husband and daughter, a social safety net that provides free access to excellent physicians, and I have education and experience enough to know my way around the system to get what I need when it hits me that I am in need. That is, I am fortunate that my life has back-up and resiliency to allow for stupid self-care. Hopefully I won't have to use it again. And it is my hope as well (and it's been proven already) that the lovely people around me also have back-up and resiliency to allow for my stupid self-care (which regretfully translated into neglect for some of my loved and much-liked ones). And to them I say, with much gratitude and humbleness....thank-you. thank you for sharing those links - that is scary stuff but better to know than not know. i'm so glad you are doing better. i, for one, have been missing you on the soothing internet. be well. hopefully i will get to even see you again soon. All I want from you is for you to take care of yourself, so I'm glad that's happening. Well, and friendship and caring, sure, but if you take care of yourself, that follows. Isn't respect the first (but not only, we've learned) rule in your house? That includes respect for yourself, your needs. How scary, but glad to read you (and the baby - congrats!) are doing OK.
lesson learned. take care of yourself. nice to see you here.